(d) (i), (ii), (iv), (iii). (d) are rich in RuBisCO. (d) Inner wall of guard cells are thick. (d) all tissues internal to endodermis. (d) are not surrounded by pericycle. (d) loading of sucrose into sieve elements. (d) being susceptible to pests and pathogens. (d) position of axillary buds. (d) shoot tips and root tips. (d) cell division, cell maturation, cell enlargement, root cap. (d) tracheids are unicellular with wide lumen. (d) differentiation of procambium followed by the formation of secondary xylem. (d) these are form of sclerenchyma with fibres. (d) xylem being sandwitched between phloem. (d) secondary dylem and primary phloem. (d) organic food moves upwardly and downwardly through phloem. (d) regeneration of cortex and epidermis. (d) diffuse porous wood is less specialised but conducts water rapidly throughout. (d) rate of shoot tip growth. 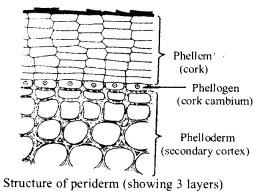 In a woody dicot stem, phellem (cork) forms the outermost layer followed by phellogen and then secondary cortex (phelloderm). Secondary phloem forms a narrow circle on the outer side of vascular cambium whereas secondary xylem occurs on the inner side of vascular cambium. In monocot root, a large number of vascular bundles are arranged in the form of a ring around the central pith. Vascular bundles are closed because there is no cambium present between the xylem and phloem. In stems, the protoxylem lies towards the centre (pith) and the metaxylem lies towards the periphery. This type of primary xylem is called endarch. In root, the protoxylem lies towards periphery and metaxylem lies towards the centre, such arrangement is called exarch. Tracheids are elongated, dead cells with hard lignified walls, wide lumens and narrow walls with spiral, annular, reticulate, scalariform and pitted thickening but without perforated end walls of septa. That is, they have intact end walls unlike vessels. Vessels are long cylindrical tube like structures made of many cells, called vessel members, each with lignified walls and a large central cavity. Vessel members are interconnected through perforation in their common walls. Lenticels are lens shaped openings formed in bark due to secondary growth. They permit gaseous exchange in woody trees. They also contribute to transpiration but in minute amounts because the suberised complementary cells present beneath the pore prevent excessive water loss. Two bands of secondary xylem i.e., autumn wood and spring wood are produced in one year. These two bands make an annual ring. The age of plant can be determined by counting the annual rings. It is called dendrochronolgy. In dicot stems, the cells of cambium present between primary xylem and primary phloem is the intrasfascicular cambium. The cells of medullary rays, adjoining these intrafascicular cambium become meristematic and form the interfascicular cambium. Thus, a continuous ring of cambium is formed. Lateral meristems are the meristems which are present along the lateral sides of stem and roots. They divide only in radial direction. Intrastelar or vascular cambium ring formed by intra-fascicular (also called fascicular) and inter-fascicular cambium; and cork cambium (phellogen) are examples of this type of meristem. These meristems are responsible for increase in girth of stem and roots. C4 plants show kranz type of anatomy. In kranz anatomy, the mesophyll is undifferentiated and its cells occur in concentric layers around vascular bundles. The vascular bundles are surrounded by large sized bundle sheath cells which are arranged in wreath like manner in one to several layers. In C4 plants there are two carboxylation reactions, first in mesophyll chloroplast and second in bundle sheath chloroplast. RuBP is present in bundle sheath chloroplasts where C3 cycle takes place. The epidermal surface of the leaf exhibits 1,000 to 60,000 minute openings called stomata. The stomata are bordered by two specialized epidermal cells – the guard cells which in some cases are accompanied by subsidiary cells. The walls of guard cells are unevenly thickened. Each guard cell has thick, inelastic inner wall and thin, elastic outer wall. Stomatal aperture is present in between the guard cells. Guard cells are not always surrounded by accessory cells or subsidiary cells. Vascular bundle consists of complex tissues, the phloem and xylem. In dicots, between xylem and phloem, cambium is present which helps in secondary growth. This type of vascular bundle is called open. While in monocots cambium is absent, so these are called closed vascular bundles. Companion cell is a type of cell found within the phloem of flowering plants. Each companion cell is usually closely associated with a sieve element. They remain connected with sieve cells by plasmodesmata. They help in loading of phloem sieve cells with sugars through active transport. Cork cambium or phellogen is a type of cambium arising within the outer layer of the stems of woody plants, usually as a complete ring surrounding the inner tissues. The cells of the cork cambium divide to produce an outer corky tissue (cork or phellem) and an inner secondary cortex (phelloderm). The common bottle cork produced from Quercus suber is a product of phellogen. In monocot root, secondary growth is absent and vascular cylinder is in the form of several alternate and radial xylem and phloem bundles. The vascular bundles are arranged in the form of ring around central pith. Their number in maize ranges between 20 – 30 whereas in Pandanus and palms, they may be upto 100. Because of the presence of numerous xylem bundles and exarch condition, xylem of monocot root is polyarch. On the other hand, in dicot root, xylem and phloem are equal in number (2 – 6) and alternately arranged i.e., they lie on different radii hence called radial bundles. According to number of ray (equivalent to number of xylem or phloem bundles) the roots may be diarch, triarch, tetrarch, pentarch or hexarch. In hypodermis or outer cortical cells, a layer becomes meristematic which is known as cork cambium or phellogen. This phellogen also cuts off cells both on its outer side and inner side. The cells cut off on outer side are phellem or cork cells and cells cut off on inner side are phelloderm or secondary cortex. Phellem, phellogen and phelloderm collectively constitute periderm. The function of periderm is protective (because at maturity epidermis ruptures and hence the function is performed by periderm). Ground tissue can be defined as all the tissues except epidermis and vascular bundles. Ground tissue constitutes the interior of organs except vascular system. It consists of simple tissues such as parenchyma, collenchyma and sclerenchyma. Parenchymatous cells are usually present in cortex, pericycle, pith and medullary rays, in the primary stems and roots. Ground tissue system of the leaves is called mesophyll. In dicot stem, cambium is present between xylem and phloem, such vascular bundles are called open. In monocot stem, the cambium is absent, such vascular bundles are called closed. Cambium are the meristematic cells which produces secondary xylem and phloem. Companion cells move sugar and amino acids into and out of the sieve elements. In “source” tissue such as leaf companion cells use transmembrane proteins to take up sugar and amino acids by active transport. Movement of sugars in the phloem begins at the source, where sugars are loaded (actively transported) into a seive tube. Loading sets up a water potential gradient that facilitates movement of sugar. In old trees, the greater part of secondary xylem is dark brown due to deposition of organic compounds like tannins, resins, oils, gums, aromatic substances and essential oils in the central or innermost layers of the stem. These substances make it hard, durable and resistant to the attacks of micro-organisms and insects. This region comprises dead elements with highly lignified walls and is called heartwood. The heartwood does not conduct water but it gives mechanical support to the stem. The peripheral region of the secondary xylem, is higher in colour and is known as the sapwood. It is involved in the conduction of water and minerals from root to leaf. Meristem is classified on the basis of position in plant bodies into lateral meristem, apical meristem and intercalary meristem. Lateral meristem is present on the lateral sides, e.g., vascular cambium (fascicular and interfascicular cambium) and cork cambium (phellogen). The chief water conducting elements of xylem in gymnosperms are tracheids. These are elongated cells with tapering ends and are dead because of deposition of lignin. These show scalariform, annular, reticulate or bordered pitted thickening. These are the only water conducting xylem elements in both gymnosperm and pteridophytes. Generally vessels are absent in gymnosperm with exceptions like Gnetum, Welwitschia, Ephedra. Barley is a monocotyledonous plant. The vascular bundle of stem is conjoint,collateral,exarch and closed (because cambium is absent). It is also scattered throughout the ground tissue. Palisade parenchyma is absent in leaves of sorghum. It is a monocot plant where the parenchyma tissues of the leaves are not differentiated into palisade and spongy. The protoxylem differentiates in the parts of the primary body that have not completed their growth and differentiation. In fact in the shoot, the protoxylem matures among actively elongating tissues and is, therefore subjected to stresses. In the root, the protoxylem elements persist longer because here they mature beyond the region of maximum growth. In this differentiation annular and spiral thickening take place. In dicot root the protoxylem is located near the periphery of the vascular cylinder, the metaxylem farther inward. In roots xylem is exarch or centripetal. In dicot stem the protoxylem is located near the centre of vascular bundle and metaxylem is located near the periphery i.e. the xylem is endarch or centrifugal. Dermatogen is the region or histogen of single layer of outermost cells formed from the apical meristem. Dermatogen gives rise to epidermis of stem and other aerial parts. Periblem is the middle histogen which forms the cortex of stem and roots. Plerome is the central histogen which forms stele or part of stem and root inner to endodennis. Part of plerome that forms vascular tissues is called procambium. The pericycle layer converts into a secondary meristem called cork cambium or phellogen which divides to form secondary cortex or phelloderm. Internode is the part of a plant stem, that occurs between two adjacent nodes. Intercalary meristem are intemodal in position and is found in the stem of grasses and other monocotyledonous plants. In early stages the internode is wholly or partially meristematic but later on some of its parts become matured more rapidly than the rest so a definite continuous sequence of development is maintained i.e., mature tissue left behind whereas new ones grow which later shows variable length. Endodermis is a single layered structure which separates cortex from stele. There are both thick walled and thin walled cells in the endodermis. The thin walled cells are known as passage cells or transfusion cells which are opposite the protoxylem groups. These cells help in rapid transport of water from cortex to pericycle. Secondary growth is observed in dicots and gymnosperm. It is not observed in pteridophytes and rarely observed in monocots. Secondary growth results in increase in girth or diameter of the stem by formation of secondary tissue by the activity of lateral meristem. So for study of secondary growth, teak (angiosperm) and pine (gymnosperm) are best suited. Xylem is the principal water conducting tissue of the plant. It consists of four types of cells-tracheids, vessels, xylem fibres and xylem parenchyma. Xylem vessels are hollow, elongated cells with open ends and pitted walls. Cells walls are lignified. At maturity nucleus is absent in vessels. The constituent cells of the phloem are sieve elements (sieve cells, sieve tubes), companion cells, phloem fibres and phloem parenchyma cells. Sieve tube members are long, slender, tube-like cells joined end to end, to form long tubular channels – the sieve tubes. Sieve tube members possess specialized sieve areas on the end walls called sieve plate. Young sieve tube members have abundant cytoplasm but their is no nucleus. The nucleus disintegrates during their development. The tissues which develop from apical meristem and procambium are known as primary tissues and these constitute the primary structures of the plant body. The development of the primary tissues causes the stem to grow in length and to some extent in thickness. Stem and root in dicotyledons show secondary growth as they have development of secondary vascular tissues (i.e., secondary xylem and secondary phloem) in them. Flowers, fruits and leaves are primary tissues. The root system of a plant develops from the hypocotyl of the embryo of a seed. The root shows following four regions these usually merge into one another, without distinct boundaries between them. Root cap zone The apex of each root is covered by a cushion of thin walled cells known as root cap. Region of cell division It lies just behind the root cap. It is the main growing region of the root where active cell divisions take place. Region of elongation The region of elongation is responsible for growth in length of the root. Region of maturation Epidermal cells of this region give out small, thin, cylindrical unicellular outgrowths, known as root hairs. These are the main absorbing organs of the root. 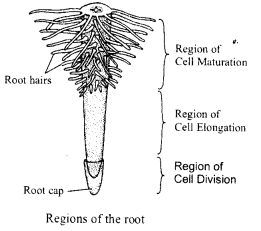 Parts of typical root root cap, meristematic growing region, zone of elongation, root hair zone, zone of meriste-matic cells. Apical meristem is terminal in position and responsible for terminal growth of the plant. Apical meristem is present at all root tips and shoot tips. The major storage component of Avocado fruit is oil. It is stored in specialized mesocarp cells called idioblast. In monocotyledons the seeds are generally endospermous. The internal structure of grain can be studied in a longitudinal section. It shows two distinct regions upper large region, the endosperm and lower smaller region, the embryo. The endosperm is surrounded by a special one cell thick layer, called aleurone layer. It is filled with aleurone grains which are proteinaceous in nature. Other components of this layer are phytin, carbohydrates and small amounts of phospholipids are also present. Chlorenchyma or assimilatory parenchyma are parenchymatous cells that possess abundant chloroplasts in them. They are capable of photosynthesis. A spore capsule of moss can perform photosynthesis because of the presence of chlorenchyma cells in them. In most of the gymnosperms, like conifers and cycads, vessels are absent and the wood is made entirely of tracheids. Such wood is known as nonporous. In angiosperms, on the other hand, the wood consists of both tracheids and vessels. The wide vessels appear as pores between otherwise small sized tracheary elements. Such a wood is known as porous. In porous wood, if vessels have essentially equal diameters and are uniformly distributed throughout the ring, the wood is known as diffuse porous. It is characterstic of plants growing in tropics. In the apices of some roots, (e.g., Zea mays, maize), there is a central region of cells which normally does not divide. This central inactive region was called quiescent centre by F.A.L. Clowes (1959, 1961). The cells of this region have lesser amounts of RNA and DNA so they have small nuclei. These cells also have a lower rate of protein synthesis. Mitochondria and endoplasmic reticulum are less developed. The cells of the quiescent centre are usually inactive. However, if already existing meristematic cells are injured or become inactive due to any other reason, the cells of quiescent centre become active. Xylem is the principal water conducting tissue of the plant. It consists of four types of cells-tracheids, vessels, xylem fibres and xylem parenchyma. The tracheids and vessels together are known as tracheary elements. Tracheids are characteristic of all vascular plant. Tracheids originate from single cells. These are single elongated cells with tapering ends. The end walls are without perforations. Their length varies from 1 to 3 mm. Tracheids are devoid of protoplast, hence dead; fairly large cavity of these cells is without any contents. The wall of tracheids is moderately thick and usually lignified. Apical meristems are situated at the tips of the root and shoot. They take part in initial growth. Plants elongate and increase in height as a result of divisions in this meristem. Promeristem and primary meristem (root and shoot apices) are included in this type of meristem. The vascular tissue of the root is characterised by radial arrangement of vascular bundles i. e., xylem and phloem occur in separate patches on alternate radii. The number of xylem and phloem groups vary from two to six. But tetrarch condition (four vascular bundles) is more common. Monocot root generally has more than six vascular bundles (polyarch). Vascular bundles in dicot stems are conjoint, collateral or bicollateral, endarch and open. They are arranged in a ring. In monocot stems the vascular bundles are conjoint, collateral, endarch and closed. They are scattered in the ground tissue. Vessels are long tubelike structures ideally suited for the conduction of water and solutes. These are made up of a row of cylindrical cells arranged in longitudinal series. The partition walls of these cells are perforated and as such the entire structure becomes tubelike. The region of the wall where perforations occur is known as perforation plate. Vessels are found in the wood of almost all the angiosperms except certain primitive members of the order ranales (vesseless dicots), e.g., Trochodendron, Tetracentron, Drimys, Pseudowintera, etc. Vessels also occur in some pteridophytes, such as Selaginella and in the members of order Gnetales of gymnosperms (e.g., Genetum, Ephedra and Welwitschia). Inulin is a water soluble ffuctosan. It is a common reserve food in members of family compositae. Pectin in a mucopolysaccharides and occur in plant cell walls. At the time of fruit ripening wall pectins hydrolyse to give constituent sugars. In plants during vascularisation, differentia¬tion of procambium occurs followed by the formation of primary phloem and xylem simultaneously. Endodermis is single layered structure which separates cortex from stele. The cells of endodermis are barrel-shaped without intercellular spaces, living and containing starch. The radial and tangential walls of endodermal cells possess thickenings of lignin, suberin and cutin in the form of strips or bands, which are known as casparian bands or casparian strips. Extra stelar secondary growth means growth in the cortical region, external to slele. For extrastelar secondary growth the cork cambium or phellogen develops in the region outside the vascular tissue. This gives rise to cork or phellem and secondary cortex or phelloderm. All the three layers (z’.e, cork, cork cambium and secondary cortex) together constitute periderm. Fascicular and inter fascicular cambuim occurs in the stelar regions. In pteridophytes and gymnosperms, sieve tubes are not arranged in linear rows and hence called sieve cells. Sieve tube elements are the conducting element of phloem. These are arranged end to end in linear rows with septa (sieve plate) between two sieve tube elements. In the sieve plate, there are present sieve pores. Sieve tube elements are living and have thin cellulosic walls in young cells but they become thick walled and are without nuclei at maturity. Sclereids are a type of sclerenchyma cells. They are short or irregular, their walls are very thick, irergular and the lumen is very narrow. These are dead cells and do not perform any metabolic functions. They show different types of lignin depositions and also have pits. They are present in hard parts like endocarp of coconut, hard seed coats fruit pulps. They are also called stone cells and are different types as brachysclereids, osteoclereids, macrosclereids, asterosclercids and fileform cells. Heartwood or duramen is the dark coloured wood near the centre of the axis formed after many years of secondary growth of stem. A small outer region, however, remains light coloured. It is known as sap wood or alburnum. The heartwood is formed due to changes in the elements of the secondary xylem. As secondary growth proceeds most of the older elements of secondary xylem lose water and become filled with organic compounds such as oils, gums, resins, tannins, and aromatic and colouring materials. The wood becomes dark coloured due to accumulating of these substances and is also termed as duramen. The sap wood is the light coloured region of the secondary xylem. Cells of this region are functionally active. The elements of the secondary xylem added by cambial activity are those of sap wood. But gradually most of these elements get transformed into heart wood. Thus the amount of heart wood increases as the tree grows older. The amount of sap wood, however, remains almost constant. The innermost layer of soft cortex is called as endodermis. This uniseriate layer is characterised by the presence of casparian strips. This thickenings was first observed by Caspary, 1865 and hence the name. Meristems shows the totipotency because xylem vessels and cork cells are dead while sieve tube cells do not possess nuclei. Periderm is produced by phellogen. The phellogen forms phellem on the outer face and phelloderm on the inner.’The three layers i.e ‘., phellem, phellogen and phelloderm jointly constitute the periderm. A narrow layer of thin walled cells found between phloem/bark and wood of dicot is vascular cambium. Vascular cambium present inside a vascular bundle is called as intrafascicular cambium or fascicular cambium. The vascular cambium is a meristematic tissue. Sap wood will decay faster. Sap wood is less durable because it is susceptible to attack by pathogen and insects. Monocot trees such as palms grow in thickness by primary thickening meristem situated at the base of the leaf. Plants like Dracaena show secondary growth by a special cambium. It develops in the form of strips just outside the vascular region. This cambial strips produce secondary vascular bundles which is amphivasal in Dracaena. Bordered pits are found in vessel wall. In bordered pits, the thickening material over arches the pit cavity in such a way that a pit chamber opens to the interior by a pit aperture. A bicollateral vascular bundles is characterised by xylem being sandwiched between phloem. Here there are two cambuim rings e.g., Cucurbita. In monocot leaf, mesophyll cells are not differentiated into palisade and spongy tissues. But there is well differentiate mesophyll cells in dicot stem. Also in the upper epidermis, there are some large cells found in groups which are called bulliform cells. The venation pattern in monocot is parallel. Phloem is the food conducting tissue of plants. The sieve tubes are food conducting elements of the plants. It is proposed that food is translocated by mass flow or by streaming currents of protoplasm. An organised and differentiated cellular structure having cytoplasm but no nucleus are sieve tubes. The sieve tubes are living cells. Their walls are thicker than surrounding parenchyma cells. Sometimes they have a special, shinning nacreous thickening. Cytoplasm occurs in the form of thin lining enclosing a big central vacuole. Angular collenchyma occurs in, Cucurbita. It has thickening at the angles and there are no intercellular spaces. It is generally found in leaf petioles. Grafting is a techinque in which cambium bearing shoot (scion = graft) of one plant is joined to cambium bearing stump (root system = stock) of a related plant through different unions like tongue grafting, wedge grafting etc. In grafting union between stock and scion produces undifferentiated mass of cells called callus. Therefore, for union between stock and scion in grafting, first to occur is the formation of callus. Callus is more or less corky secondary tissue developed lay woody plants over a wound. It is derived from cambium. Pericycle of root produces lateral roots. Endodermis is followed by pericycle. Usually it is a continuous layer but in some monocots it is interrupted by xylem and phloem. It is the seat of origin of lateral roots and cork cambium. The root branches are, therefore described as endogenous in origin. Collenchyma occurs in climbing stems. Collenchyma occurs in the stem and petioles of dicot herbs. Due to deposition of pectin, it has high water retaining capacity. Since pectin appears at the angles, it becomes a spongy tissues. The collenchyma is a mechanical tissue which gives tensile strength to the plant. Monocot leaves possess intercalary meristem. Intercalary meristem are responsible for localised growth. Perhaps they have been separated or detached from the mother meristem e.g., meristem present at the base of leaves in many monocots, in the intemode of grasses, at the top of peduncles of Plantago and Taraxacum etc. Cork cambium and vascular cambium are lateral meristems. Both are responsible for the secondary growth of stem. It also increases the girth of stem. Ring porous wood carries more water when need is higher. Ring porous wood provides better translocation when requirement of plant is more. Hence, it is very advanced than diffuse porous wood. Sieve tubes are suited for translocation of food because they possess broader lumen and perforated cross walls. Sieve tubes are elongated tubular conducting channels of phloem. The end wall possess many small pores and have thin cellulosic wall. Death of protoplasm is a pre-requisite for a vital functions like transport of sap. Xylem is a dead tissue and do not have protoplasm, xylem performs the function of transport of water or sap inside the plant from roots to leaves. The tunica corpus concept was given by Schmidt (1924) which was based on plane of divisions of cells. According to this concept there are two portions in shoot apex-tunica and corpus. The tunica shows only anticlinical divisions and thus it is responsible for surface growth. The corpus shows divisions in all plane and thus responsible for volume growth. Pith and cortex do not differentiate in monocot stem. Since numerous vascular bundles lie scattered, the ground tissue system in a monocot stem is distinguishable into hypodermis and ground parenchyma. In hypodermis or outer cortical cells, a layer becomes meristematic which is known as cork cambium or phellogen. This phellogen also cuts off cells both on its outer side and inner side. The cells cut off on outer side are phellem or cork cells and cells cut off on inner side are phelloderm or secondary cortex. The phellem or cork cells are dead and have deposition of a fatty substance called suberin (i.e., cork cells are suberized). Suberin is impervious to water and thus cork cells are buoyant (i.e., float on water). Phellem, phellogen and phelloderm collectively constitute periderm. The meristem that helps in increasing girth is lateral meristem. The lateral meristem is responsible for lateral growth of the plant i.e., growth in thickness e.g., cambium and cork cambium. It divides only periclinally or radially and is responsible for increase in girth or diameter.